Singer Building down Broadway from the post office. Detroit Publishing Company. address 149 Broadway at Liberty Street Submitted by silverton on Mon, 04/02/2012 - 4:54pm.. The church in the foreground is St Paul's Chapel. The chapel served as a place of rest for the recovery workers at the World Trade Center site..
Other buildings visible are the U.S. Realty Building and the Trinity Building. The U.S. Realty Building is adjacent to Zuccotti Park which has become known for the Occupy Wall Street protests.. 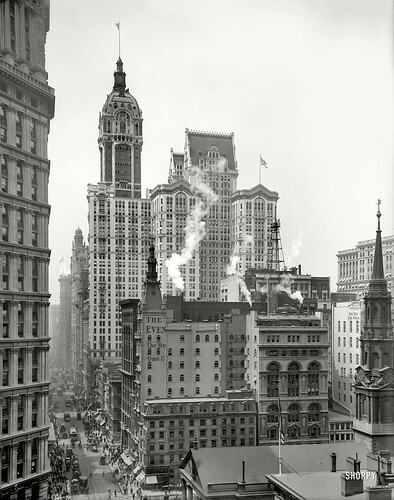 The photo was taken from the old City Hall Post Office & Courthouse building at Broadway & Park Place. The Post Office building was commonly called "Mullet's Monstrosity". Razed in 1939..